Dr. J Earl Danieley still has his wits about him. That’s for sure. 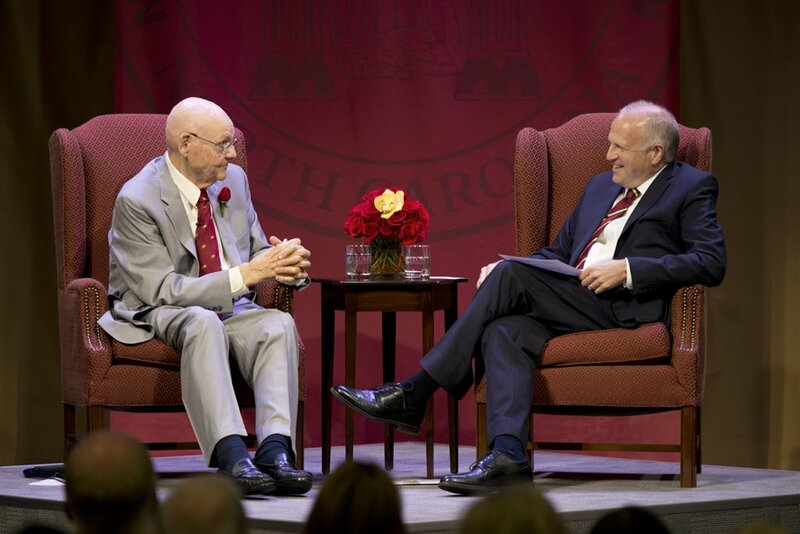 Today, during his convocation “conversation” with current President Leo Lambert, Dr. Danieley incited laughter, smiles and memories as he recounted his 70 years with Elon. Leo Lambert: So tell me how chemistry has changed over the last 70 years. [Dr. Danieley told a story for nearly 5 minutes] Leo Lambert: But you still haven’t told me about how chemistry has changed! Dr. Danieley: Oh yes! Wait, I have to tell you one more thing first! Dr. Danieley’s storytelling: I counted at least seven, detailed, enthusiastic stories. Dr. Danieley’s thesis: There is no more remarkable story in all the history of higher education than this institution. The audience was invited to join in singing the last verse of Elon’s alma mater at the start of the ceremony. Dr. Danieley sang along with the choir for all four verses without missing a lyric. His mental energy and school spirit is astonishing. Someone once said to Dr. Danieley, “If you can’t go to college, go to Elon.” Dr. Danieley used it as his motivation to build.